PORTLAND, Ore. — Hundreds of protesters from the right and left faced off on downtown streets here Saturday, with police declaring an increasingly tense situation several hours in to be a “civil disturbance” and trying to disperse the crowd through the use of flash grenades and pepper spray. On a sun-drenched afternoon, the confrontation was just the latest upheaval in a city that has seen repeated and sometimes violent demonstrations since the election of Donald Trump in November 2016. 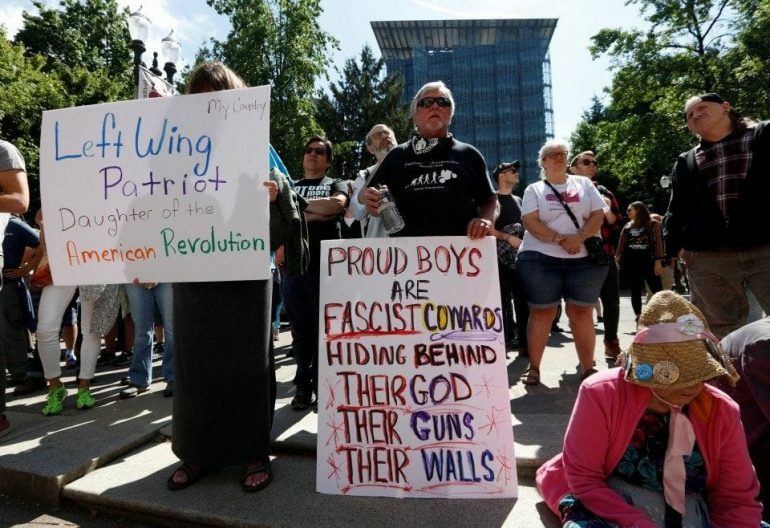 The counterdemonstrators had come to oppose the presence of two groups, Patriot Prayer and Proud Boys, which were teaming up on a permitted rally in a popular riverfront park. As police tried to get both sides to leave, people at times scrambled through traffic to avoid the clouds of pepper spray. Live-stream shots from the scene showed at least a few individuals bleeding after being hit by projectiles or attacked. Police later announced that four people were arrested on a variety of charges, including harassment, attempted assault on a public safety officer and unlawful use of a weapon.